Sautéed reindeer (poronkäristys in Finnish, renskav in Swedish) is perhaps the best known traditional meal from Lapland, especially in Finland and Sweden. Usually steak or the back of the reindeer is used. It is sliced thinly (easier if frozen and then only partially thawed), fried in fat (traditionally in reindeer fat, but butter and oil are more common nowadays), spiced with black pepper and salt, and finally some water, cream, or beer is added. Often fried with chantarelles and leeks. 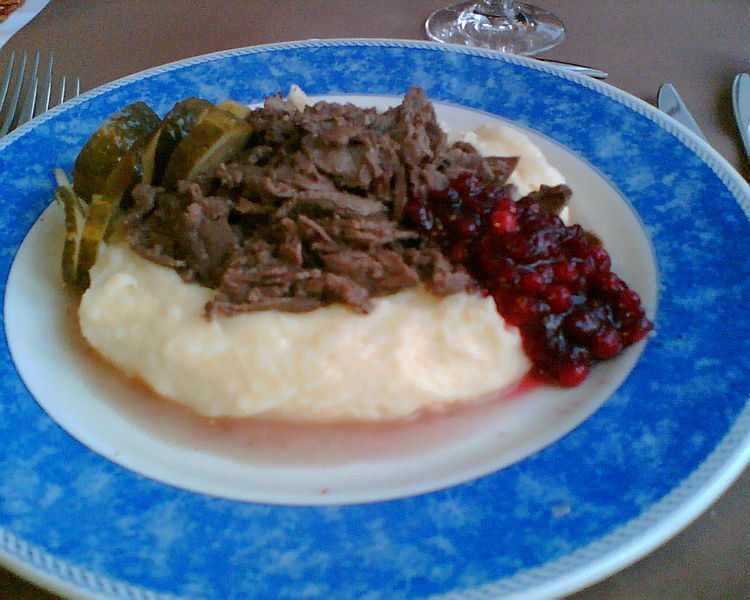 Served with mashed potatoes and cowberry preserve or, more traditionally, with raw cowberries mashed with sugar. In Finland it is often served with pickled cucumber, which is not as common in Sweden. *Instead of beer, you can use cream or water. Brown the sliced reindeer meat and chopped onions in butter, preferably in a cast iron casserole pot. Season the meat with salt and pepper and add the flour, stir. Add the beer and stir again. Place the lid on top of the pot and allow to simmer at a low heat for approximately one hour. Serve the Sautéed Reindeer Sauce hot together with mashed potatoes, lingonberry jam, pickled beetroots and pickled cucumbers.